“Reading the Riot Act” is a common phrase, but at least once in Ripley’s history, it was a reality. The occasion was the election of 1868. 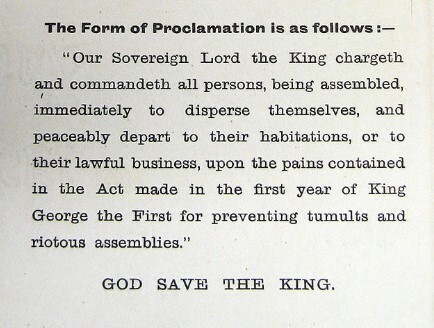 The 1867 Reform Act had extended the franchise : about a third of the adult male population now had the vote, including some men who rented property rather than owned it. The majority of working men in Ripley, and all women, were still excluded. On the day of the election, Thursday 19th November, a crowd of young men gathered outside the Thorn Tree pub in the Market Place, which was being used as the Conservative committee rooms. They catcalled the gentlemen who went to vote, and some of them began to knock off their top hats, a practice known as “bonneting”. Later in the afternoon, some began to throw stones, and broke some of the pub windows. When they turned their attention to the premises of Mr Nuttall, one of his sons fired a revolver at the crowd, wounding one man. Angered by this, the crowd began to break the windows of known conservatives in the town, starting with those of Dr Allen and moving on to others including Mr Wain, Mr Alleyne, the manager of the Butterley Company, and the vicar, the Rev. Ketchley. Eventually it appeared that they were smashing windows of any premises whose owners had the vaguest connection with the conservatives. In the evening Mr Hall, a magistrate, stood in the Market Place, and literally read the Riot Act. This meant that any gathering of 12 or more people was illegal, and could be dispersed by force. The mob then disappeared, and peace was restored. Special Constables were enrolled and the town was patrolled by police from Derby. It was later claimed in newspaper reports that none of the rioters were from Ripley; incomers from Clay Cross were blamed. Then as now, reports in the press varied. The true blue Derby Mercury claimed that “semi-educated electors” had “natural tendencies towards the settlement of all questions of the day by physical force” whilst the more liberal Derbyshire Advertiser blamed the firing of the revolver, especially as Mr Nuttall was apparently notorious for having claimed that a wage of two shillings a day was enough for a working man. 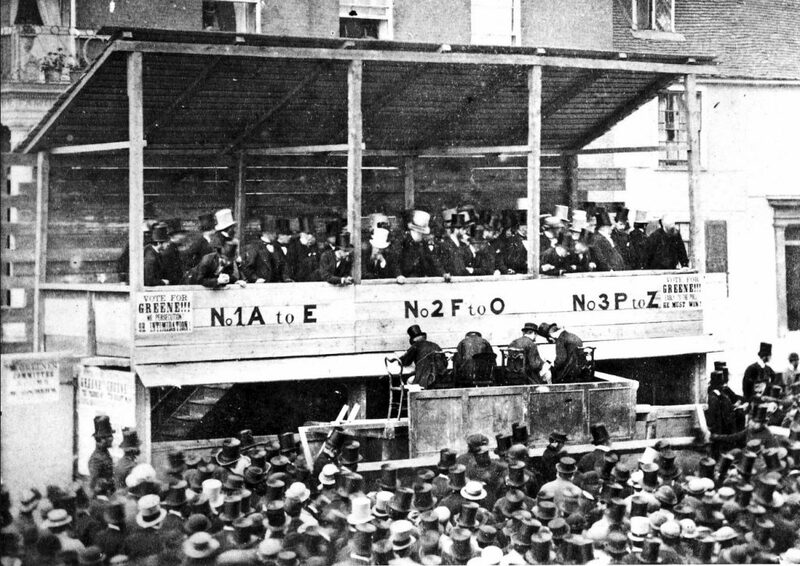 The following day thousands of people visited the town to see the damage for themselves, an early example of disaster tourism. The results of the election were interesting, too. Although in Ripley and Belper (where there was also unrest), the Liberals Evans and Colville gained double the votes of the Conservatives, Sir Thomas Gresley and Rowland Smith, in the constituency as a whole, the Conservatives were elected, whilst in the country as a whole, Gladstone’s Liberals increased their majority to over 100 seats. Not for the last time, the town’s results went the opposite way to the national trend.